PARIS: French investigators were examining the black boxes from the Boeing 737 MAX aircraft that crashed in Ethiopia on Thursday, as the ban on the model went worldwide after President Donald Trump added the US to countries that have grounded the aircraft. France’s BEA air safety agency confirmed it has received the recorders from the plane that crashed shortly after takeoff from Addis Ababa on Sunday, killing all 157 people aboard. BEA investigators will try to retrieve information from the cockpit voice and flight data recorders, which were damaged in the disaster. 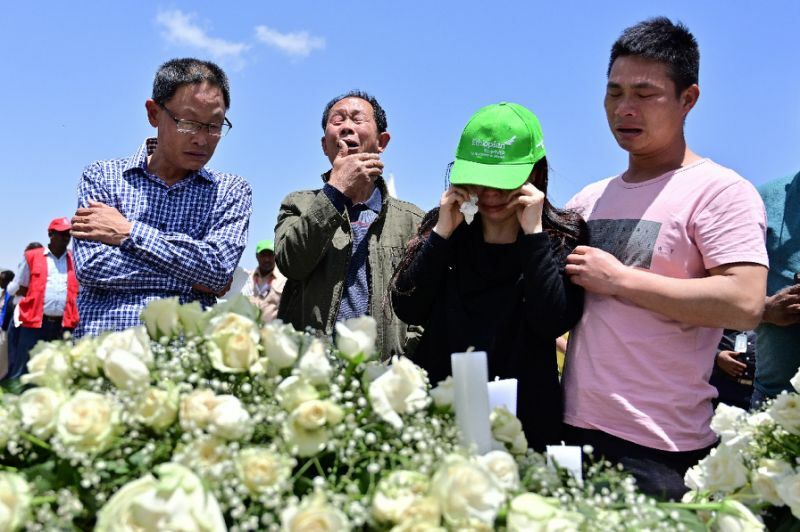 Thousands of kilometres away, distraught families were demanding answers as they visited the deep black crater where the plane smashed into a field outside the capital, disintegrating on impact. The plane was less than four months old when it went down just six minutes into its flight to Nairobi. Ethiopian Airlines, Africa’s largest carrier, sent the boxes to France because it does not have the equipment to analyse the data. The information that black boxes contain helps explain 90 percent of all crashes, according to aviation experts. The Federal Aviation Administration said findings from the crash site near Addis and “newly refined satellite data” warranted “further investigation of the possibility of a shared cause for the two incidents”. Trump told reporters the “safety of the American people and all peoples is our paramount concern”. FAA acting chief Daniel Elwell said the agency has been “working tirelessly” to find the cause of the accident but faced delays because of the damage to the flight data recorders. The new information shows “the track of that airplane was close enough to the track of the Lion Air flight… to warrant the grounding of the airplanes so we could get more information from the black boxes and determine if there’s a link between the two, and if there is, find a fix to that link,” Elwell said on CNBC. Boeing’s shares have sunk 10 percent since Sunday’s crash, wiping more than $20 billion off the company’s market value. Boeing chief Dennis Muilenburg said he supported the US decision “out of an abundance of caution” but had “full confidence” in the safety of the plane. The company continues its efforts “to understand the cause of the accidents in partnership with the investigators, deploy safety enhancements and help ensure this does not happen again,” he said in a statement. The MAX series is Boeing’s fastest-selling model, but it is still relatively new with fewer than 500 in service. In two anonymous reports on flights just after the Lion Air disaster, pilots disconnected the autopilot and corrected the plane’s trajectory. It was unclear if US transport authorities review the database or investigate the incidents. However, the FAA said this week it had mandated that Boeing update its flight software and training on the aircraft. Questions about the Lion Air crash have honed in on an automated stall prevention system, the MCAS, designed to automatically point the plane’s nose downwards if it is in danger of stalling. Ethiopian Airlines CEO Tewolde GebreMariam said Sunday the flight’s captain Yared Mulugeta Getachew, 29, was an experienced aviator with more than 8,000 flight hours. BEA said any information about the investigation would come from Ethiopian Airlines, which itself tweeted that it would only communicate through social media and its website. Andrew Hunter, a defence industry expert at the Center for Strategic and International Studies in Washington, said that while Boeing and the FAA had good track records on addressing safety concerns, sometimes the combination of automated systems and humans did not work smoothly. “The fact the system was fighting the pilot was not an unintended consequence,” because it should counteract a pilot error and correcting this is “challenging”.